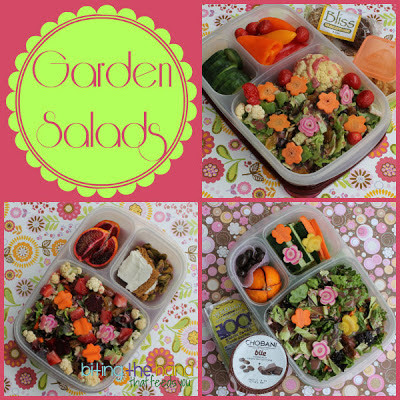 Biting The Hand That Feeds You: One Prep, Ten Salads! 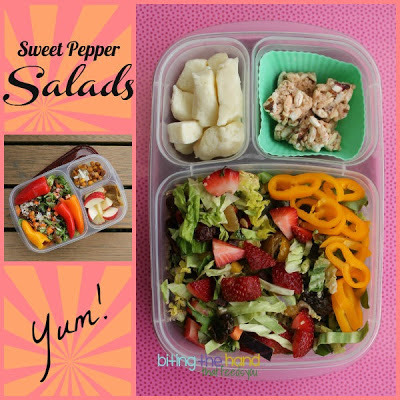 The more times I've prepped my salad base in advance, the more I grow to appreciate not only the ease and simplicity of packing lunches, but also the speed. I almost never have to pack my lunch the night before anymore. Unless we're leaving fairly early (any time before 10am *cough*) or I know I'll be busy doing other stuff the next day, I can pack before we leave the house for the afternoon. These lunches were from March and April of this year, and around then I was getting a head of lettuce and a head of cabbage each week in my weekly CSA farm share, along with carrots and beets and broccoli. When I first joined a few years ago, I was either giving away my greens or watching them rot in my fridge. But last Summer when I joined back up, I challenged myself to let nothing go to waste. I haven't been able to quite get there yet, but I'm close. It means that instead of my favorite spinach salads all year, I'm stuck with lettuce and cabbage roughly September through May (I don't eat it fast enough to buy spinach at the grocery as well, and add it in too,) but I'm a big girl, and I can eat things that aren't my favorites. Plus I can make them yummy with my add-ons and dressing! Or reward myself with a treat for after! I usually prep my salad base on a weekend, when Hubby can keep the kids off of me, since I'm waving around sharp objects. It lasts me somewhere around one to two weeks, depending how big the heads are and how fast I eat through it. 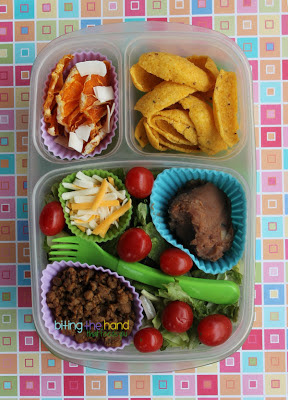 I chop up a head of lettuce, some cabbage (a small head, or half, depending if I've used some elsewhere,) and my carrot and beet scraps from making cute shapes in our lunches. If I have broccoli that's been sitting around a while, or if it's building up from getting it for several weeks in my share, I chop the florets into smaller bits and add them in too. But I don't think I had any in this batch. While I'm prepping the salad, I can also create more scraps by prepping some beet and carrot cut-outs for the following few days, and storing them in a sealable container with a bit of water. 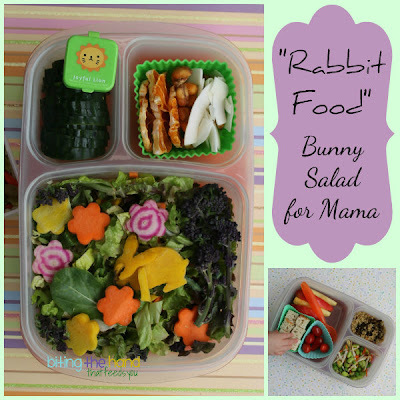 This saves time later, since I can whip up an attractive salad in no time by just plopping on a carrot mouse and some flowers! Plus I don't have to get out my toothpick and spaghetti noodle and fondant shaper tool thingy to pop the shapes and scraps out of all the nooks and crannies of the more detailed cutters every. single. day. 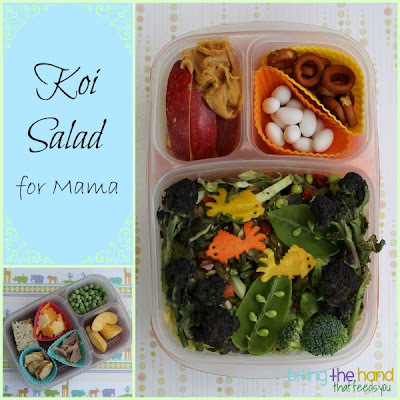 You can also pre-fill dressing containers and your add-ins (mine usually include hemp hearts, sunflower seeds, and raisins, although I've been known to change it up a bit.) And maybe a pile of forks... in case you're forgetful like me! 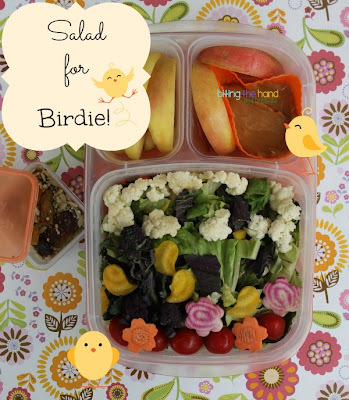 Having a large container of salad base in my fridge not only makes packing my lunches easier, but can help out at dinner time too, if you eat salads frequently, or need a quick meal idea at the last-minute! 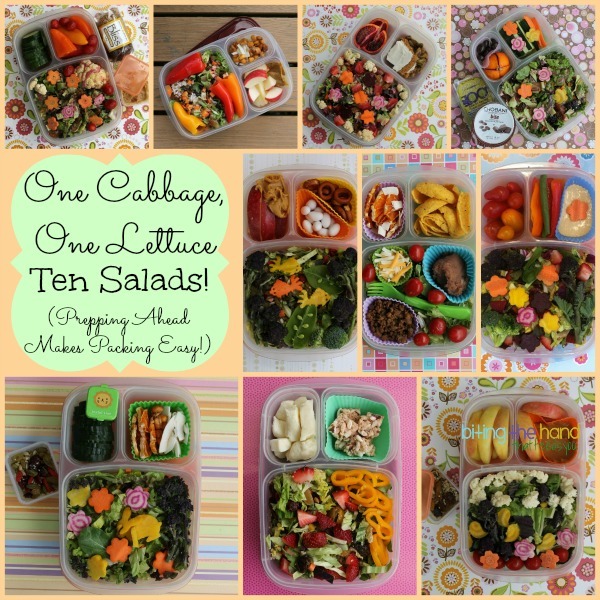 Spend 15-minutes Chopping, Have 10 Salads Ready to Go! 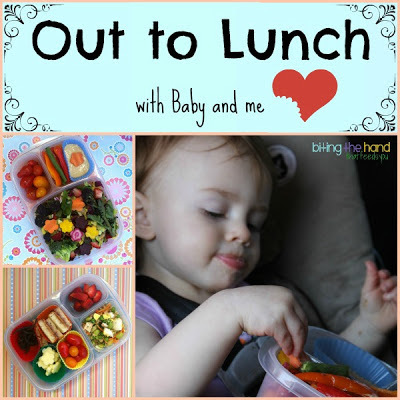 You may have seen all these particular lunches already, but here they are again. All from one big container of prepped salad base I keep in the fridge plus some artistic details, when I had the time. And different sides on a day-to-day basis, depending on what needed to get used up first, or if I was feeling I needed more of a treat!